Wrap yourself in the warm embrace of the financial instrument called the Credit Puppy! Our credit puppy is cute, furry and eager to please, and he’ll help you get the credit you need without asking any troublesome questions about your financial past. The application process could not be simpler (only three forms and a routine scan) and you won’t even have to FAX any documents! ** The YD Industries Credit Puppy is ready to take your application and lend to you NOW so financial security can be yours, guaranteed, within 24 hours. 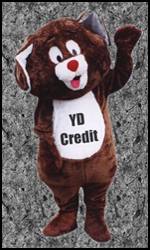 Schedule an appointment with a Credit Puppy at your local YDI Financial Services Depot or call now to talk to a financial specialist immediately. Operators are waiting to answer your call or put you on hold. * YD Industries generous credit lines are regulated by the national credit recuperation laws with multi variable climbing vine interest rates. Rates are subject to the blind sampling by the agencies provided for with remaining TARP funds but that under no officially informal supervision by Patriot Act agencies. YD Industries will do it’s best to keep your financial information secure, but sometimes things happen and servers are breached and all that information suddenly seems not quite as secure. The credit puppy turns into a carnivorous loan wolf if random payments are not received in a pre-timely manner according to the terms set forth in sections 103.b, 217.kk, 807.c (2009 – 38.798% APR turbo boost revision), and 1072.jj of the cardmember agreement tome. Other restrictions may apply. ** Certain situations will require document faxing.